Swaggering onto the scene with some sleek style! Built for speed, mobility and aggressive traction around the field the Nike Mercurial Vapor XII Elite DF SG-Pro AC Football Boots in Black Lux and Gold are exactly what your games been missing. 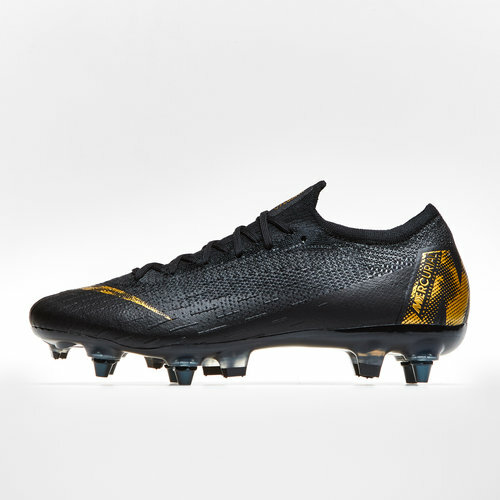 These football boots come as part of the Nike Black Lux pack which brings a black and gold paint job for all four silos. This pack looks and provides every bit of luxury that the name suggests. This pack is low-key but oozes class. these boots feature gold accents on blacked-out uppers while utilising an animal-skin inspired textured effect that takes its cue from the Mercurial's new "fast by nature" direction. The high-end designs of these boots are sure to have you standing out on the pitch.